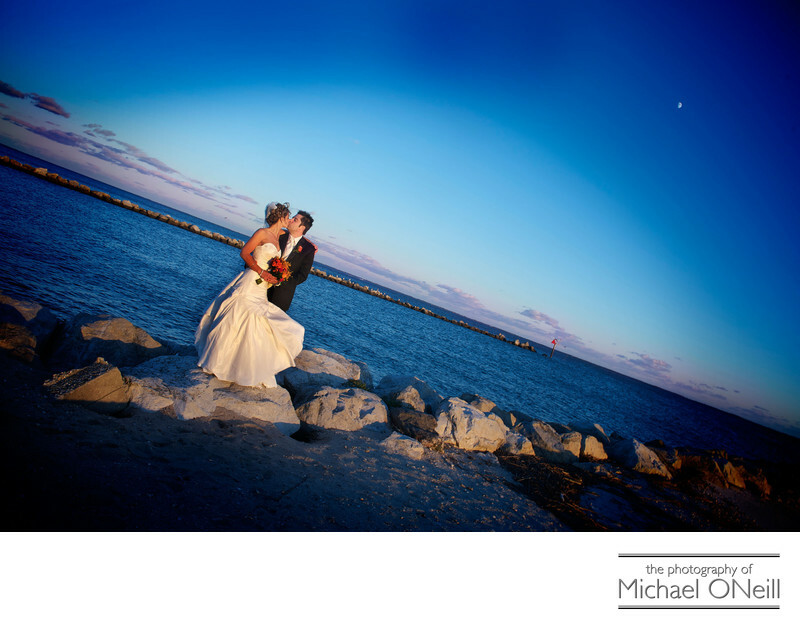 Another beautiful sunset wedding picture and yet another taken at one of Long Island, New York’s premier waterfront catering establishments: Land’s End in Sayville, NY. Located right on The Great South Bay, Lands End has their very own private beach facing Fire Island. I can’t tell you how much I love this establishment. I’ve had the experience of working here many times and have always been impressed. The food is superb. The service is impeccable. The architecture is elegant and the waterfront views are awesome! This picture was taken right at sunset on a beautiful summer evening just before the bride and groom went into their reception to dance and party the night away with their friends and family. Waterfront catering venues run along both shores of Long Island, NY. Some of my other favorites are The Venetian Yacht Club in Babylon, NY, Lombardi’s on the Bay in Patchogue, NY, The Crescent Beach Club in Bayville, NY, Chateau La Mer in Lindenhurst, Gurney’s Inn and The Montauk Yacht Club in Montauk, Oceanbleu at The Westhampton Bath and Tennis Club, The Allegria Hotel in Long Beach, Lombardi’s on the Sound in Port Jefferson and The Harbor Club at Prime in Huntington. I am an experienced wedding photographer for all of these venues and invite you to call me to discuss your plans for a wedding at any of these fine waterfront establishments.